There are few American national parks as iconic as Acadia. Founded in the early 1900s and spanning a territory of more than 49,000 acres, millions visit the park every year. You’ll find Acadia National Park located on the central southern shores of Maine. The scores of natural habitation along the Atlantic coast for animals and vegetation make Acadia a must see for wilderness seekers. Furthermore, Acadia is the home of many historic sites. Famous mountain ranges line the park and are some of the most striking experiences for visitors. Among the famous landmarks of the park is Cadillac Mountain. The mountain sits on the largest island bordering the shores of Maine, Mount Desert Island. It towers as the highest peak on the North Atlantic seaboard. Thanks to its altitude, it is the first place to see the sunrise for nearly half the year. There are many campgrounds within the park’s boundaries. Among these wonderful campsites are both private grounds and group options. Because of the popularity of the campsites, it is highly recommended that you make reservations. You could plan your trip on the fly, but you might be disappointed if there’s no room left. To help keep the park running, there are fees for both the private and group campsites. Also, because Acadia is national park land, there are rules for proper etiquette when visiting. Blackwoods offers a wooded camping experience within a 10-minute walk to the Atlantic coast. Though sporting paved trails, ranger stations and shuttle service, the site offers rugged environments and plenty of room for isolation. The mountainous area provides panoramic views while the campsites are well-leveled and hospitable. During the busy season, Blackwoods Campsite is one of the most popular areas. Though the site is open year-round, most visitors choose to plan their trips starting around early Spring. At this time of year reservations are strongly advised. In the Winter and Fall months, you will find this location quieter. Less people means more room to wander uninterrupted. Still, it is always a good idea to make a reservation. You’d be surprised just how many people enjoy camping in cooler seasons. The Blackwoods campground is within 5 miles of Bar Harbor. You’ll find it on Route 3 and the site allows you to bring one car within the camp site. There is additional parking in the lot. However, that can fill up rather quickly. If you bring too many cars, you might be forced to park on the road just beyond the park line. This helps to keep overcrowding to a minimum. Reservations for this site can be made up to half a year before your trip. This is a generous window of time to plan your vacation accordingly. If you arrive the day of your visit hoping to find a spot, it is unlikely you’ll find anything. This is the case from the beginning of Spring until mid-October. When you arrive at Blackwoods, you must check in with the ranger station at the front entrance of the park. If you don’t, you could be asked to leave. The fees for a single campsite are $30.00 per night. Group campsites are also available at Blackwoods and for those the price is doubled. A nightly fee of $60.00 will reserve the group site for your friends and family. The group sites can accommodate RVs and provide a place to really lay down the homestead. Though you’ll still be sleeping under the stars, there are some convenient amenities to help you feel less rugged. There is running water at the camp sites as well as flushable toilets. There are no showers within the campsite. That said, for a fee you can grab a shower in the neighboring town. Located a half mile away, Otter Creek provides stores and supplies for campers year-round. What’s more, there are free shuttles to travel within the park and neighboring locations. For meal times and campfires, each site is equipped with picnic tables and fire rings with grills. This helps to provide a communal feel and limits the amount of gear you need to bring. Keep in mind that there is no electricity on the single, group or RV campsites. Blackwoods offers a host of fun-filled activities for you and your group. From canoeing to hiking and biking the park provides plenty of ways to keep you occupied. Paved trails provide excellent scenic routes through the entire area. There are guided tours of the park’s landmarks including the famous Bass Harbor Head Lighthouse. 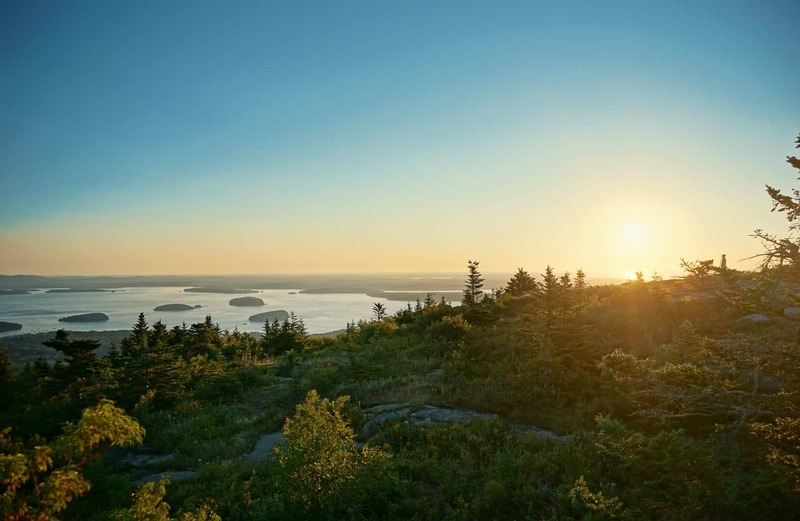 The majestic Cadillac Mountain towers above the park and offers visitors breathtaking panoramic views of the entire area. Schoodic Woods offers access to a slightly more rugged camping experience with options for hike-in, secluded camp sites. A heavily wooded area within a 15-minute walk of the Atlantic Ocean. As with Blackwoods, you can book a reservation for a campsite at Schoodic woods up to half a year in advance. The difference here is that you must make a reservation to be permitted to camp in the park. Walk-ins are not allowed. This park offers campsites with electricity as well as access to group and RV sites. Private, hike-in locations are also available and lack electricity. For those wanting a rugged camping experience, these are great environments to leave the grid. The fee for the standard electricity sites is $30.00 per night. For group sites the price is $60.00 per night. Because no electricity or other accommodations are included with the hike-in sites, the fee is $22.00. RV locations, including electricity are $40.00 per night. Each campsite includes electrcity unless it is a hike-in site. Campsites are also available with running water but must be booked specifically. The sites that include electricity also provide picnic tables and fire rings with grills. There are no showers within the park. That said, access to paid showers is available at the neighboring town of Winter Harbor. The roads within the park are paved and provide seasonal shuttle service within the park and neighboring areas. These shuttle services are free from late May until mid-October. Though the hike in sites offer a rugged and isolated experience, keep in mind that campfires are prohibited in these areas and they don’t include tables or fire rings. You can use a small gas stove for meals. Schoodic Woods park is famous for its secluded hikes. This campsite is less crowded than some of its neighboring locations. Because of this, it is often the choice for those wanting a more “authentic” camping experience. A one-way road offers access to the entire circumference of the park. There are many scenic spots where it is permitted to pull off the road to relax. Because of its proximity to the water, boating is also a popular activity. Canoes and kayaks can be taken down to the coast line. Secluded hikes are also popular and can be taken on the paved road or off the beaten path. Riders also enjoy the ability to take advantage of the paved one-way road for scenic treks along the coast line. Located on the the west coast of Mount Desert Island, Seawall Campsite provides one of quietest locations in Acadia. Geared for families and heavily wooded, the site is within 10-minutes walking distance from the ocean. Nearby Echo Lake offers boating, canoeing and fishing. Campsites at Seawall can also be booked up to half a year before your trip. There are individual campsites, as well as group and RV sites. The group sites are more limited and can only be booked from March 15. Though RV accomodatoins can be made, the park notifies visitors that space is extremely limited and roads are tight. Larger RVs are not recommended for this area. The fee for single and RV campsites is $30.00 per night. For group sites the price is doubled at $60.00 per night. There are hike-in locations available at $22.00 per night. Because Seawall attempts to maintain a quiet environment, there is no electricity in any of the campsites. Make sure to book a reservation before visiting the park. There are no walk-in campers permitted at Seawall. The park offers flushable toilets and running water at every site except the hike-in grounds. Likewise, picnic tables and fire rings with grills are available at all sites except hike-in locations. There are no showers on within the park. Paid showers can be accessed in the neighboring town around 1 mile away. The roads within Seawall are paved and provide an easy driving experience as well as comfortable hiking and bike riding. Furthermore, from late June to mid-October, free shuttles offer access to many locations within the park as well as neighboring towns. There are also many scheduled bus stops around the park that provide convenient ways to trail heads and activities. Peaceful hiking, along the west side of the island, borders Southwest Harbor. What’s more, Echo Lake provides canoeing, swimming and fishing in a secluded and quiet area. Designated picnic areas are located near the lake and provide a tranquil respite from the busier side of the island. The three campsites mentioned above have in common the type of gear you’ll want to bring with you. The one exception is if you decide to go with one of the hike-in campsites. Then, you’ll want to have a couple of extra things. This is essential for all of the campsites unless you’re planning on booking an RV site. You’ll want a waterproof tent that sleeps at least enough people that will be on the trip. It’s always a good idea to overestimate by at least one person for the size of tent you’ll bring. This ensures having ample room for tossing and turning. A tent is not very comfortable unless you’ll be lining it with a sleeping bag. Get one that suits the season you’ll be camping in. Some of these campsites remain open at times of the year when it can be quite cold. Pack accordingly. If you’ll be camping in the fall, you want a bag that keeps you nice and toasty. Also, it’s a good idea to pack a pillow of some kind. Rolling up a pair of pants to sleep on can get old fast. 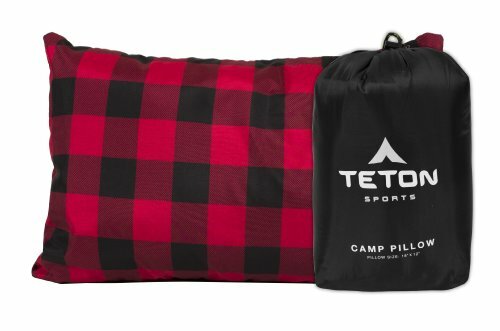 There are some sleeping bags that actually have the pillow build in to the bag. These are convenient and are low profile when packing your gear. You don’t need to pack your whole wardrobe, but it’s nice to have at least one change of cloths for a few days trip. Pack a couple pairs of pants and shorts for when they get dirty or wet. Also, a pair of short you can swim in is particularly important since these campsites boarder bodies of water and lakes. It’s a great feature of these campsites that they include picnic tables and fire rings with grills for cooking. You won’t need to pack a cooker or stove unless you’re camping at one of the hike-in locations. However, you do need to bring your own coals and food. That also means silverware and cutlery, as well as a cooler to preserve meats and other perishables. Some extra things you might want to bring include flashlights with extra batteries and a power supply if you’re camping in one of the non-electric sites. Family games or books are also a good way to relax during the long hours of your trip. Also bringing an instrument can add a communal enjoyment while gathered around the campfire. A multitool or knife is a good thing to carry whenever you’re camping. The Core Dome Tent provides ample space and good weatherproofing. 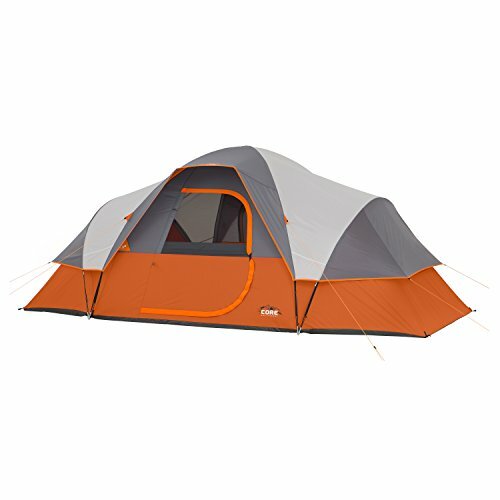 At a fair price for the amount of space you get, this is a great place to start when putting together your gear for your trip. 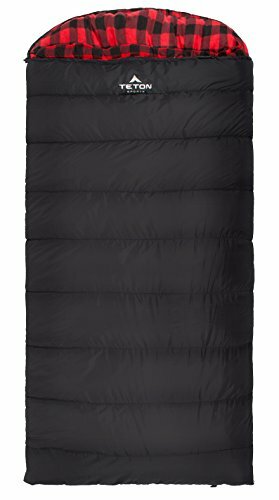 The Teton sleeping bag provides warmth for all seasons and an extra padding for comfortable sleeping. This one won’t break the bank and can be your go-to sleeping bag for the whole family. Though the pillow is not sewn into this model, you can pick up the Teton pillow for around $12.00. The most convenient feature of both the bag and pillow is the ability to stuff them into the drawstring carrying cover. No need to roll them up and waste valuable real estate. The Teton Pillow offers that extra comfort you’ll appreciate for a restful night’s sleep. Including it’s own carrying case, this makes for one of the most travel friendly sets on the market. 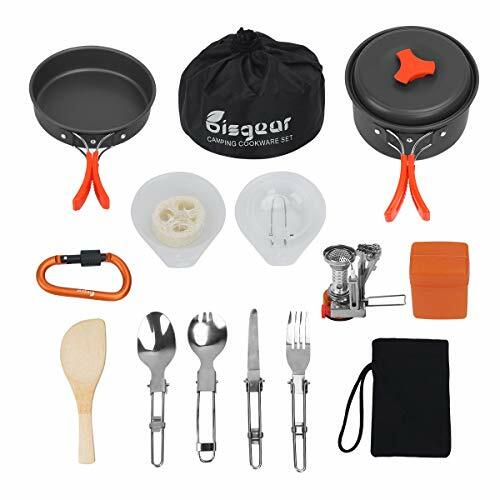 The Bisgear Camping Cookware Set offers a great way to keep your supplies in order. With all the basics you’ll need for a small to medium sized trip, this set provides the comforts of home. You get a pot, pan and multiple cooking utensils that will come in handy around the campfire.